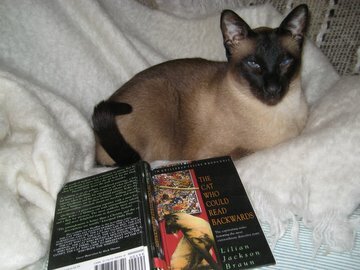 I've always enjoyed The Cat Who series of detective books by Lilian Jackson Braun; they have to be a must-read for all Siamese cat owners. Starting with The Cat Who Could Read Backwards, the novels are about Jim Qwilleran (emphatically spelled with a 'w', not a 'u'), an out-of-work, divorced, recovering alcoholic, slightly-past-his-best ex-crime reporter who washes up as a feature writer for the Daily Fluxion, a small-town newspaper. Jim's new job as a writer in the Features Department is to cover art, antiques, interior design, architecture and cooking, amongst other things. However, it's not long before homicides in the art world have Jim and his highly intelligent partners-in-detection, Koko and Yum Yum (two Siamese cats he acquires through the deaths of their original owners) solving murders all over town. The author, Lilian Jackson Braun, owned Siamese cats herself. She started writing The Cat Who series after one of her cats was killed after falling from the tenth-floor balcony of her apartment block. She writes lovingly and descriptively about the cats, Ko Ko (real name Kao K'o Kung) and Yum Yum, who always manage to upstage Jim by solving the crime themselves. The Cat Who series includes some lovely little snapshots of perfectly-told Siamese cat behavior. was forming in his glossy brown head. with one hind leg and an expression of catly rapture"
Along the way Jim (known also as Qwill) inherits a fortune and moves to the fictional town of Pickax, Moose County, which is "400 miles north of everywhere" – thought to be northern Michigan. One of the neighboring towns is called Brrr! For anyone familiar with the UK's Midsomer Murders TV series, the town of Pickax has an equally high body count and The Cat Who series has a similar tongue-in-cheek style. The novels are an easy read and have a devoted following. All the books are fun although, to me, the earlier ones are the best. Of these, The Cat Who Had 60 Whiskers was the last book to be published. A further book, The Cat Who Smelled Smoke was promised, but was cancelled by the publishers with no explanation. Many readers felt that The Cat Who Talked Turkey may have been the last book actually written by Lilian Jackson Braun, as the style and quality of the final three books was quite out of character. By the time they were written, though, Lilian Jackson Braun was in her 90s, so the differences may just have been her age showing in her writing. In general The Cat Who series is light and frothy, good fun and easy reading, will teach you a lot about art and design and food and Siamese cats - and they make a great present for Siamese cat lovers! Surprisingly, you can still find most, if not all, of the books on Amazon so if you're missing one, two or several and would like to complete your collection you can see the complete list and buy them here .